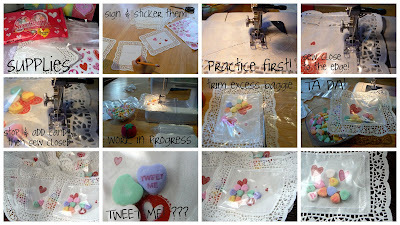 MIH Product Reviews & Giveaways: Sew Cute Valentines! I saw a link to Zakka Life about some cute crafty valentines, and at the end she posted another style she made. I thought it was so cute I had to ask my 6 year old which ones she wanted to make. So I scratched my other crafty idea for valentines and made these instead! Everything came from the Dollar Tree store, they were out of heart shape doilies so I found rectangle doilies in their wedding decorations sections (much easier to sew a straight line, than a heart shape line anyways, haha). I made these way ahead of time, so just don't plan to make them the night before. It took me probably 2 hours, and be sure to practice sewing on a spare doilie because at first I wanted to use a cute zig zag stitch, but it ate my doilie up! So I recommend a straight stitch. I am participating in Made By You Mondays, Valentine SYS Party and Making The World Cuter with my Valentines! Those are just precious Rachelle! Such a great idea! I love how they turned out. Your doily Valentines came out just perfect. And I really like how they look with the rectangle doilies.